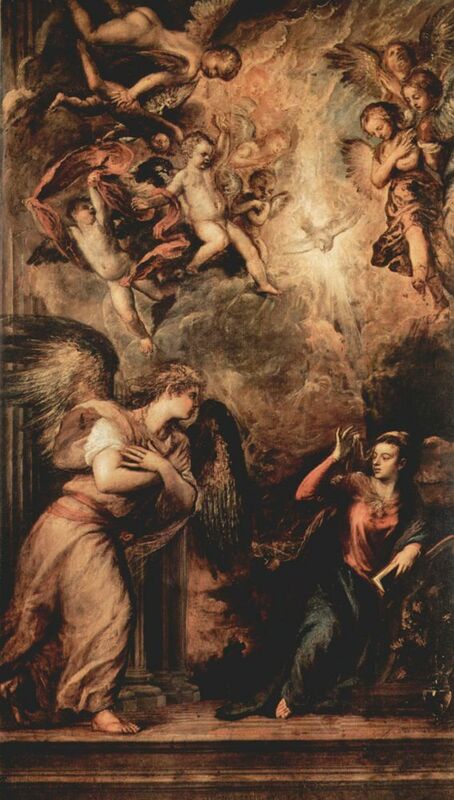 In the Annunciation Mary is moving her veil as a sign that she accepts the words of Gabriel while behind the sky is opening revealing quires of putti and angels. 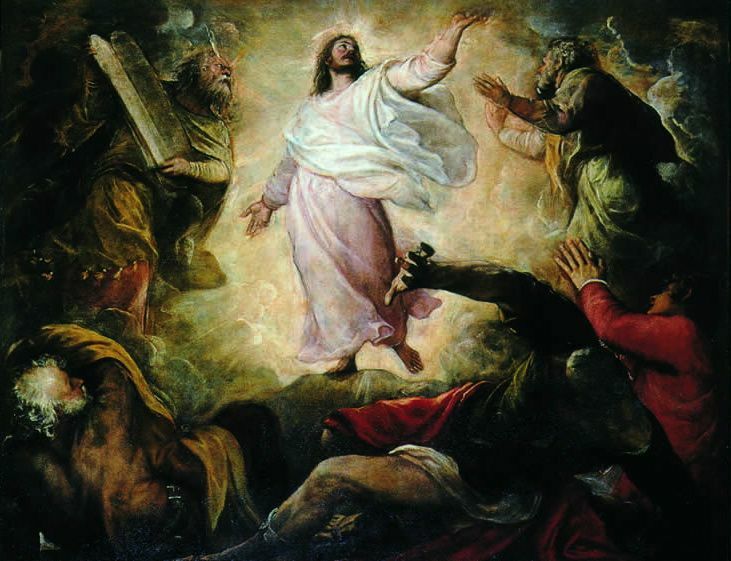 In the Transfiguration on the main altar, Jesus, while telling his apostles that he is the Savior, is turning as shining as the sun. Both paintings are extremely theatric, especially in the use of light that emphasize the sudden presence of the divine in the world. See the difference with the painting of the Banquet in Emmaus, made 50 years before (artist uncertain, maybe Carpaccio or a follower of the Bellini school). Everyone sits with dignity, the colors are bright and the moment is solemn. There is no revolutionary message like in Titian, rather the representation of an elegant and self-confident society. Some of the rich merchants who frequented the church (strategically located between San Marco and Rialto), were buried here, like for example the very generous Bartolomeo Bompelli of whom you can see his frescoed burial chamber under the first dome. Among the most illustrious Venetians there was Caterina Corner, queen of Cyprus, who was forced by her family to donate the island to the Venetian Republic and was then sent in exile on the hills of Asolo. She proved to be a real queen by making out of her distant and small court a center of art and poetry, frequented by artists like Giorgione and poets like Bembo. See her monument on the right wall. This is not only a church where you see masterworks and learn about important Venetian families but also a place where you can see, through the paintings, the changes over the decades in the 16th century society. 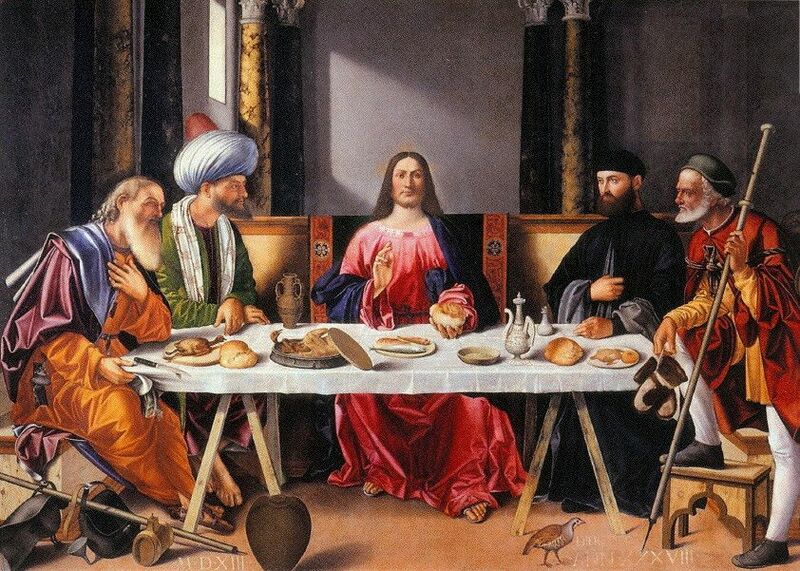 This entry was posted in News and Curiosities and tagged Annunciation, Banquet in Emmaus, Carpaccio, Caterina Corner, San Salvador, Titian, Transfiguration, Venice, Venice churches, www.slow-venice.com by slow-venice. Bookmark the permalink.